Little nontraditional recap tonight. Felt the need to toss a photoshop together in excitement. 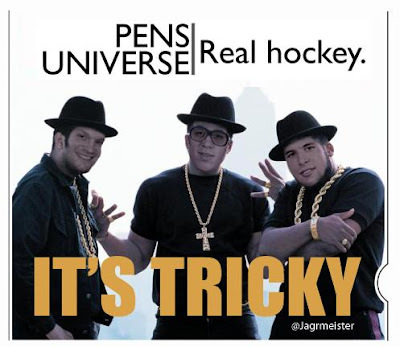 This is where my evil mind takes me, from thinking of Geno's hat trick to RUN-DMC. Well, there you have it. The Pens came back home after that 5 game road swing with a solid victory and 9 points total for the Two-Headed Monster. Can't really say Sid was due (I guess you could, he was scoreless last game, eee) rather it was Geno who came out of his shell with a hatty. Yet somehow ended up with a -2 on the night. Odd. 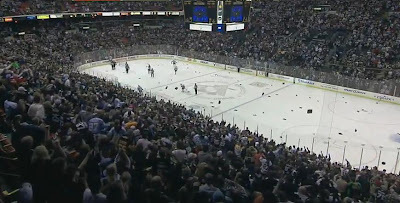 Nevertheless, the Pens held on and became victorious. As great of a night Geno had it was indeed overshadowed by a 6 point effort from SUP87MAN. Tallying a point on every goal of the game for the Pens it was Sid who inched his way 4 points behind the leading scorer in the NHL, Henrik Sedin, and is now tied for the most goals in the league. Couple that with winning 70% of his faceoffs and you've got your Hart Trophy winner my friends. The Penguins as a team played much better hockey. We saw some great efforts by Jordan Staal which you wont read about in the papers tomorrow. Likewise Fedotenko, Kennedy, and Cooke all added some serious 2-way play all night. 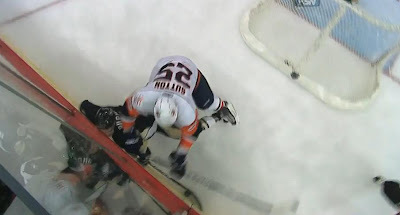 Sadly near the end of the game we saw Pascal Dupuis go down hard from a hit by 6-6, 245 lbs Andy Sutton. Before that we saw Dupes get a few good chances. ACTIVITY: The Pens were very active with the puck in the first two periods. We saw a lot of good movement, particulalry on the powerplay. Definitely need more of that and less turnovers. POWERPLAY: Going 4-7 on your powerplay when you previously went like 1-100 is pretty darn good. 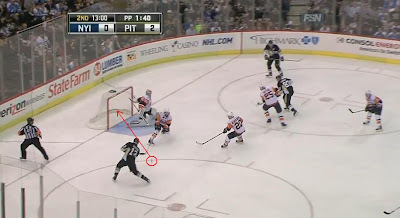 Geno was responsible for 3 of those goals while Billy G netted the other. This might just be the spark the team needs to get their confidence back. GOALTENDING: Despite letting 4 pucks enter the net, Beej did fairly good. Especially early on he had some stops that you and I both know John Curry wasn't going to make. The Okposo shorty breakaway and the penalty shot to name a few. Though things got a little shaky to start the third, Geno and Sid took over and sealed the deal. CROSBY: You might wonder why the hell I'm adding Sid under the category of "different." He's otherworldly, as Steggy said. Well, I felt he did play different, better different obviously. Not that any of us doubt the kids ability, but he just did all the "extra" little things to completely take over this game. Positioning, is perhaps the intangible most overlooked. Crosby is a master at it. FACEOFFS: Sure the Pens have been great all year mainly because of Sid, but winning the circle 41 out of 60 times in unreal. Staalzy won 16 of 21 at 76%, that's legit. Sid's fortuitous bounce, as Errey notes. Geno's first of the night. A rip from the high slot. Dad just killing it with an insane dish from Sid. 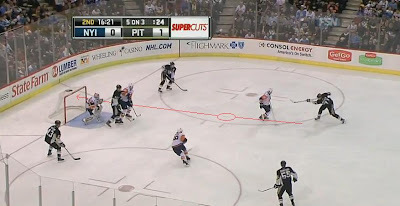 Beej making himself wide and long for the Okposo shot. 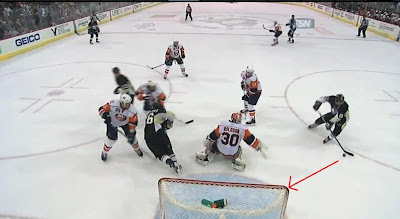 Letang owes him a beer or ten. Talbot becoming the victim of a tripping penalty. I need a good photoshop idea for this one. Looks 15 here. This hit had me shaking. Dupes went down like Kevin Stevens when he broke his face on the ice. Also against the Islanders, oddly. Another view. Shouldn't happen. Sutton needs to get suspended.